Manifestation: Morozko signals his presence with the abrupt sound of ice cracking or trees snapping from the weight of snow. Attributes: An icy scepter; anyone who touches his scepter instantly falls asleep and will allegedly never awake. Daughter: Snegurochka – The Snow Queen. Morozko is responsible for the ferocity of Russian winters. Whatever he touches with his staff instantly freezes. Morozko can raise or lower the temperature and cause snow to fall. Morozko is petitioned for snow and for safety from snow. In a famous Russian fairy tale, a step-mother sends her step-daughter out into the forest at night, assuming that Morozko in the guise of freezing weather will kill the girl. Morozko does find the girl, but when he inquires whether she’s cold, the girl answers so politely and bravely that even his cold heart is touched. Father Frost makes her a fire and sends her home with gifts the next morning. The step-mother then sends her own daughter out into the woods at night, presuming that she’ll come home with valuable gifts, too. The spoiled girl whines and complains to Father Frost, who lets her freeze to death. In 1966 the Russian film “Morozko” features a kinder, gentler Father Frost. He doesn’t kill the step-sister, only humiliates her. 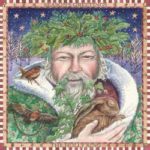 Ded Moroz or Father Frost, the Slavic version of Santa Claus, long ago became the symbol of Russian winter, New Year’s and presents. He is usually accompanied by his granddaughter Snegurochka riding with an evergreen tree in a traditional Russian troika, a sleigh drawn by three horses abreast. Ded Moroz is a Slavic fictional character similar to that of Father Christmas. The literal translation is “Old Man Frost”, often translated as “Grandfather Frost”. Ded Moroz brings presents to children and often delivers them in person on New Year’s Eve. 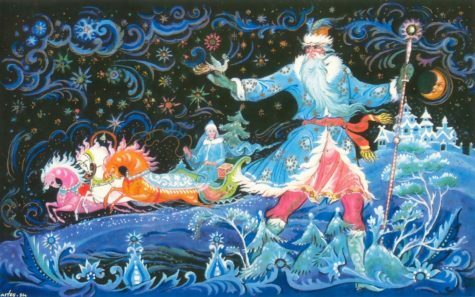 Ded Moroz is accompanied by Snegurochka the “Snow Maiden”, his granddaughter and helper, who wears long silver-blue robes and a furry cap or a snowflake-like crown. She is a unique attribute of Ded Moroz, since similar characters in other cultures don’t have a female companion. The original Russian gift-giver was Saint Nicholas, the country’s Patron Saint, whose Feast Day is celebrated on December 6th. 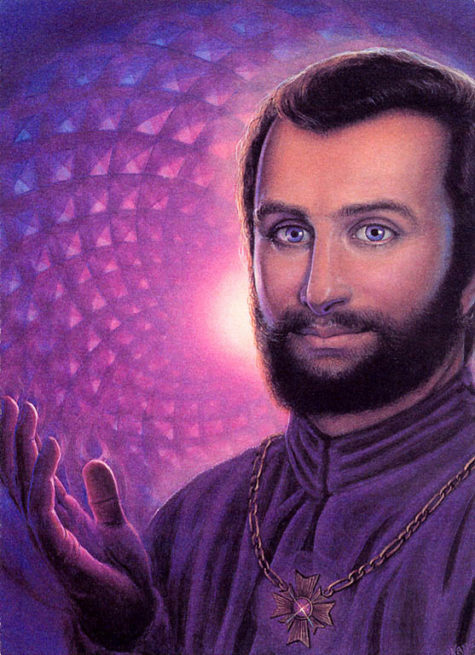 The image of Saint Nicholas originates from the image of another hero – the ancient Morozko. 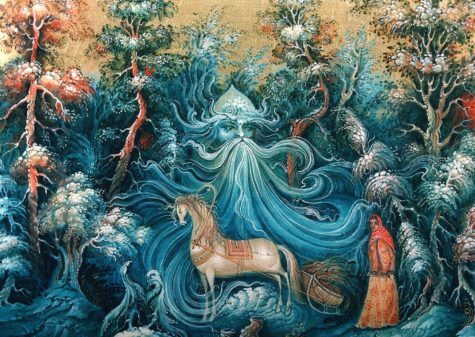 In Russian folklore Morozko is a powerful hero and smith who chains water with his “iron” frosts. Morozko was not hostile to people – he helped them and presented them with awesome presents. In fairy tales Morozko is at times kind and at times evil. To be precise, he is kind towards the hard working and the good-hearted, but extremely severe with the mean and the lazy. And it is not about justice only. It is rather about two personalities living in one magical person. In 1917, with the Bolshevik Revolution, Ded Moroz was banished into exile. He was considered a kind of a kids’ god, which was impermissible during Soviet times when Russian leaders were flatly against any manifestations of religiousness. But only 20 years later Ded Moroz returned to the country and New Year’s celebrations became public. Since then Ded Moroz and Snegurochka appear on New Year’s Eve, putting presents under the fir tree for the kids to find in the morning. Those wishing to make acquaintance with Ded Moroz in his domestic surroundings can board trains and travel to the picturesque town of Veliky Ustyug in the Vologodsky Region of Northern Russia (approximately 500 miles northeast of Moscow) where, situated in the dense taiga forest at the confluence of three rivers, sits the log cabin of Ded Moroz. There, in Veliky Ustyug, Ded Moroz waits through the summer reading letters that kids from all over the country have written to him regarding the presents they wish to find under the New Year’s Tree the next January 1st. Ded Moroz has a number of distinguishing features. His shirt and trousers are made of flax and are usually decorated with white geometrical ornamental patterns. His fir coat is ankle long and is embroidered with silvery stars and crosses. His a semi-round fur hat is often red and embroidered with pearls. He has a long white beard. Ded Moroz wears mittens and a wide white belt. His footwear is luxurious – high boots with silver ornamentation, but on an exceptionally chilly day Ded Moroz can opt for valenki! And finally he never appears without his pikestaff – made either of silver or crystal, it possesses a twisted gripe. It helps the not-so-young Ded Moroz make his way through the deep dark forest during long winter nights.